The other day, I watched the Food Network’s Melissa d’Arabian prepare French Onion Soup on Ten Dollar Dinners. It looked so hearty and elegant, yet really simple. It inspired me to try it out, so I put on my vegan thinking cap and came up with this version. I really love onions, but have never caramelized an entire pot of them. It was definitely worth the hour-and-a-half wait to do this, because the taste was absolutely amazing: this was one rich, sweet and smoky soup. Fresh thyme is essential here—it really compliments the onion-infused broth and gives it a rustic and earthy feel. Start by slicing the ends off of the onions and peeling them. Slice them vertically in half, then slice each half thinly into half-moon shapes. 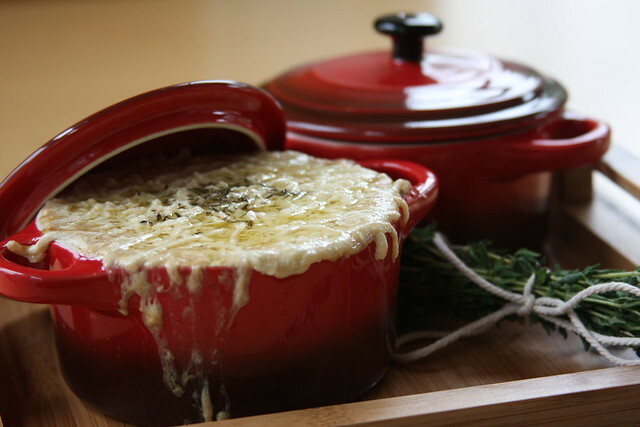 In a large dutch oven, melt the Earth Balance over medium-low heat. Add in the onion and sprinkle with some salt. Cover and let them sweat for 45 minutes. Uncover, stir and sprinkle with a little more salt. Increase the heat to medium and saute for 45 minutes more, or until a rich caramelized color is achieved. Sprinkle the onion with flour and stir well for about a minute. Add in the sherry to deglaze the pot and then throw in the thyme sprigs and bay leaves. Slowly pour in the stock and add the Not-beef bouillon cube. Simmer for about 10 minutes more. Remove the bay leaves and thyme. Ladle the soup into small crocks and place a toasted baguette on top. Sprinkle with some of the Daiya and place into a 400-degree oven to melt for about 7 minutes. Remove and serve immediately. In these cold days here in Brazil, this recipe will be very welcome! OMG! This looks amazing! I love how you put the whole picture together, it should be on some vegan cookbook cover 🙂 It makes my mouth water and just looking at it I can almost taste it! I will be trying the recipe soon, but I will never be able to make it look as pretty as your version. Thanks Elisabeth! Setting up the shoot was fun. We've had the tiny crocks sitting around for a while and it was good to put them to use! I hope you enjoy the recipe! Yum! It's been so long since I've made French onion soup and then I saw it on tv this week and I've been craving it ever since! Yours looks fantastic! Thanks Nami! I hope you can make and enjoy the recipe … Love your blog! Your pictures are so lovely! I don't think I've had french onion soup since the early 90's. This post made me want to make it ASAP! I'll have to try it with gluten free bread. Mmm! Thanks Amanda — glad the recipe inspired you to make it … I hope you enjoy it! Thanks so much Sara … nice to "meet" you too! How many servings does this create? This looks so delicious! French Onion Soup is a Christmas Tradition on my husbands side of the family, but ever since we went vegan, they no longer make it. I can't wait to try this out, and bring the tradition back in a kind version!